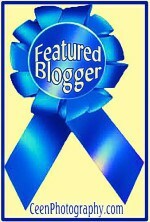 This award is for bloggers who are generally fairly new to the blogosphere to help get to know each other better. 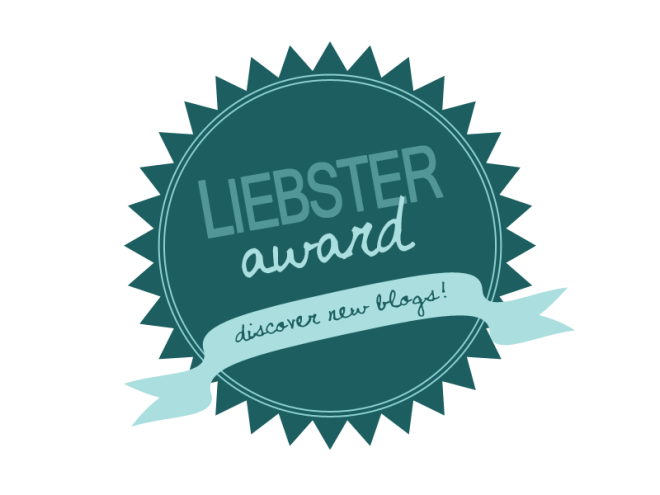 The fun thing about the Leibster Award is that when you receive it you then may nominate some people too – so in this way you share the love of good blogs you have discovered. Mainly as a new learning experience for 2014 – a New Year’s resolution I guess you could say. 2. What’s your favourite topic to write about? 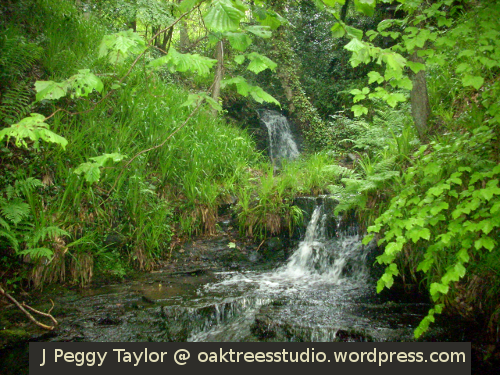 Creativity – my own projects, the creativity of others, or the creativity of Mother Nature. 3. What advice can you give to other bloggers? Travel the world on WordPress and talk to people by leaving comments – most people will talk back to you and often will repay your visit too. 4. What is your favourite way to spend a free afternoon? Ha! What is a ‘free afternoon’?! A relaxing afternoon for me would be either wandering in the woods observing and photographing the beauties and intricacies of the natural world, or, on a ‘lazy’ afternoon I’d be pottering around and gardening in my back yard. 5. Can you share two or three of your favourite posts, either from your own blog or from a blog you like? I decided to share three of my posts that I think help show what my blog is about. 6. What destination is top of your wish list? I am not much of a traveller but I love to learn about the world through the eyes of others – amazing landscapes, nature, culture and history. There’s always a treasure trove of travel tales and images just waiting to be explored! 7. What’s your favourite season of the year and why? That is a difficult question for me, but I am going to choose Autumn, by a whisker. I love the colours, the smell of the woods, the fabulous skies, the fruit-picking. Autumn always feels like a good time for starting something new too. 8. If you had to pick one country or place to stay in for the rest of your life, which would you choose and why? There’s plenty of beautiful countryside in northern England to enjoy – hills and dales, rivers and lakes, nature and history in the landscape – that’ll do for me. 9. Give a tried and tested travel tip? Read up on the place you’re going before you go and allow time in your trip to really absorb the experiences you encounter … and don’t forget your maps! 10. What can we watch out for on your blog in the next few months? 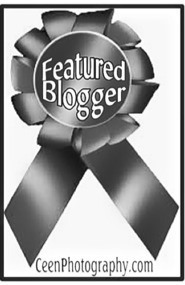 My nominations for the Liebster Award are three blogs from around the globe that I always enjoy. Lumiscatter and I share a love of gardening and an interest in the natural world. Mukhamani has a very life-affirming outlook on life. I love her photos of India too. Wandering Iris finds some fabulous places to photograph and some great odd-ball images too. 2. Which seasoned bloggers have inspired you most? 3. What new things have you learned from blogging? 4. Do you have a helpful blogging tip to share with new bloggers? What is it? 5. Which do you prefer, home-made food or eating out? 6. If you could take a holiday anywhere in the world where would it be and why? 7. Can you choose your favourite post from your blog? What makes it special? 8. Can you share three posts you’ve enjoyed recently from blogs you follow? 9. Where would you prefer to live, in the city or the countryside? 10. Have you ever received a handmade gift or card? Why was it special? When I saw the themes of two of this week’s photo challenges, it made me remember an interesting industrial archaeology project we worked on a couple of years ago. For Cee’s Fun Foto Challenge this week we are seeking out “straight lines”. For the WordPress Daily Post’s Weekly Photo Challenge we are considering “contrasts”. In the place we were exploring our industrial archaeology we noticed several combined instances of these concepts. Our local area is full of industrial history as we live on part of the Durham Coalfield. Remnants of old mine shafts, iron workings and networks of old railway lines and waggonways are woven into this peaceful green and rural landscape. 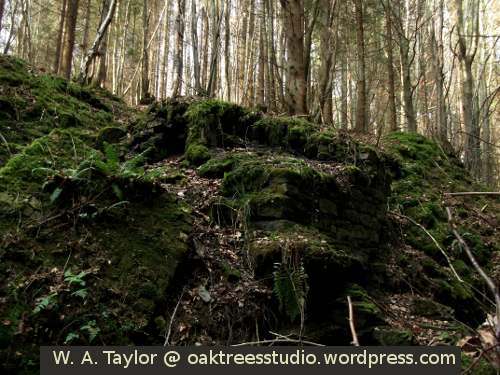 It must have been a very different environment a hundred years ago when coal mining here was at its height. The noise, the dust and the smoke have all gone completely. The collieries, old spoil heaps and railway tracks are now gradually assimilating into the landscape. Reclaimed by Mother Nature and grown over with woodland (some natural, some planted), unless you know their story, you don’t really notice them at all when you pass by. This straight track is part of the old railway line. This railway carried steam locomotives hauling their cargo of coals to the River Tyne. 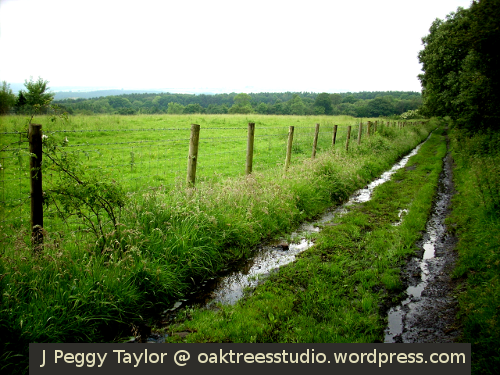 Now it is a peaceful footpath where we watch butterflies and pick blackberries as we look out across the wooded valley. 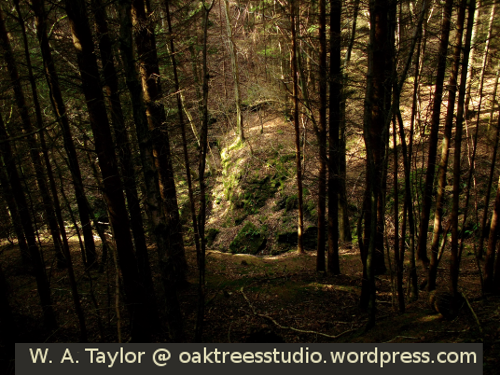 Sunlight searching through this steep-sided stream gully provided a stark dark/light contrast from our vantage point on the hillside between some tall, dark conifers. Blocks of moss-covered stone masonry built into the bankside are all that remain of this early 19th century coal mine shaft. The horizontals of the masonry contrast with the verticals of the conifers above. 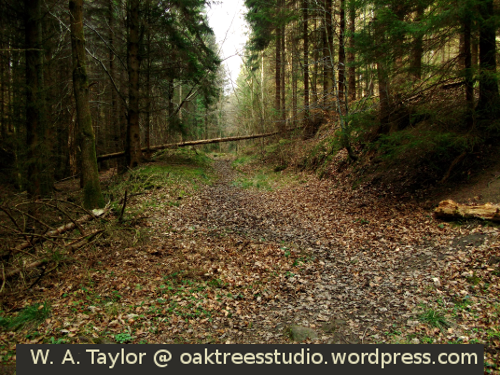 A wide, flat, straight pathway through a hillside conifer plantation. This pathway would have been a wooden waggonway, with horses drawing the truckloads of coal from the mine along to the colliery yard. 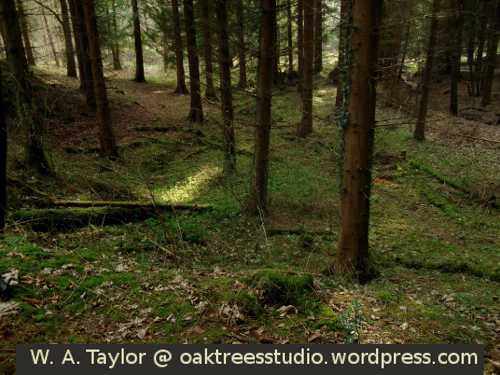 A shaft of sunlight glances across a woodland floor. A century ago this used to be a noisy, busy colliery yard. Most of these photographs were taken by my son. He loves to seek out interesting patterns in the landscape. 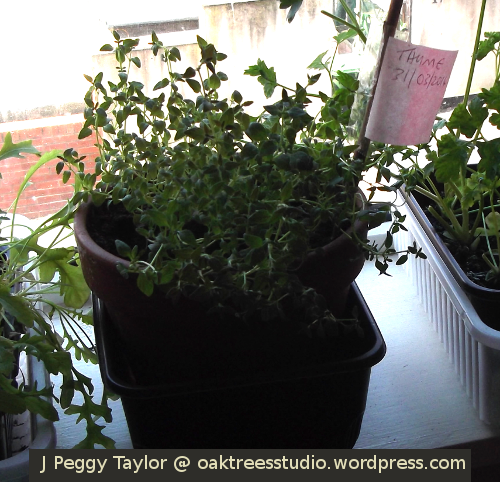 This year I have started afresh with growing the herbs I use most – some indoors, some in my back yard. I have Parsley, Sage, Thyme and Mint. As well as using fresh herbs over the Summer, I will also cut and dry some sprigs from all of my herbs except the Parsley. One of the advantages of growing herbs at home is that I can also dry or preserve herbs for use when my herb plants are less productive during the colder months of the year. Sage, Thyme and Mint are all easily dried for future use. I don’t dry Parsley but I generally put some in the freezer from the Summer crop, as well as keeping a pot herb on a warm window ledge over Winter which can still be snipped occasionally for garnishes. 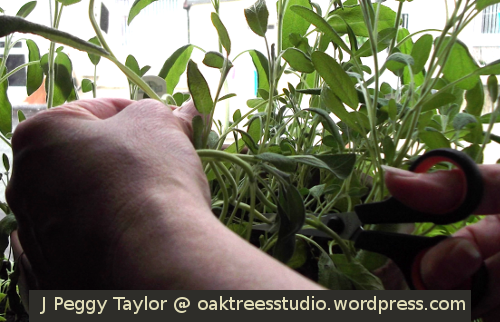 Today I was cutting my first batch of Sage for drying. It’s best to cut herbs early in the day before the sun evaporates their plant oils as we want to retain as much of the oils as possible for their flavour and health-giving properties. I snipped all of the main Sage stems by about two thirds, leaving about a third of each stem, making sure there were some side shoots on each stem stump waiting to sprout away. 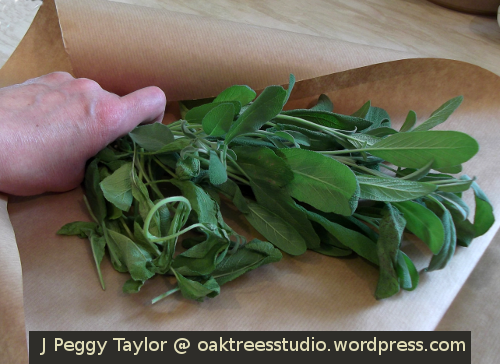 As I’d been growing this pot of Sage indoors, the cut stems and leaves were clean enough ready to bag up for drying without needing any extra washing. Then it was a simple task of arranging my bundle of Sage with stem ends together in a paper wrapping. I used some brown kraft paper for wrapping my herbs today, but I’ve also used newspapers or paper bags of various sorts for this purpose. All we need to do when drying herbs is to tie up the herbs in small bunches and exclude light to help preserve the colour a little. Small bunches of herbs are best as they dry more evenly. There is always a risk with larger bunches that the leaves will develop mildew rather than drying properly. I also check my herbs after a few days just to make sure they are drying successfully. The bunch of Sage I had cut today I made up into one bundle. 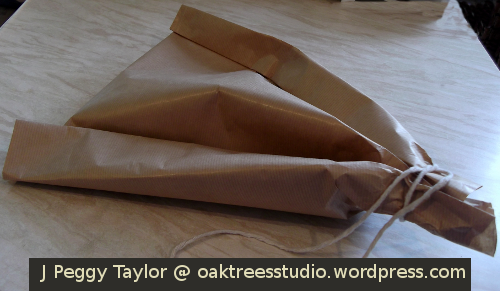 My bundle of paper-wrapped Sage is then hung up to dry with the leaves pointing downwards. Hanging herbs upside-down to dry helps to direct any plant oils in the stems into the leaves, which is where we want them. I’ll show you the next stage when the Sage is dry – that will be rubbing the Sage and packing it into a jar. When my Soapwort was looking sickly and needed a tonic, I knew just the thing to help restore it to a healthy state. It was time to give this plant a shot of my ‘magic potion’ for plants … or as some of you may know it, liquid Comfrey feed. Fortunately, I have some left over from last year so that has given the Soapwort a boost. Comfrey is a substantial herb, growing about a metre (3 feet) tall, with hairy leaves and rather rough stems. The oval leaves are larger at the base, decreasing in size as they grow up the stem. The flower colour varies depending on the particular species. 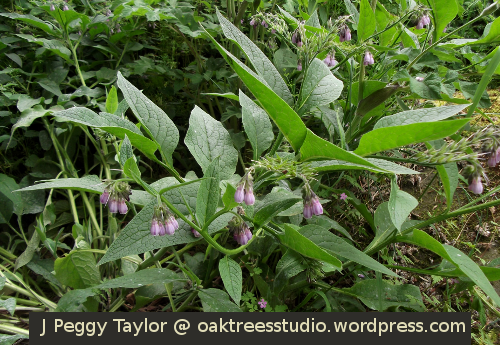 In our neighbourhood it is Russian Comfrey Symphytum x uplandicum that grows abundantly and this species bears pinkish-purple flowers in curved clusters. I’ve used it for most of these purposes in the past but I still collect some every year to make up a new batch of free, organic, liquid plant food. This plant food is rich in potash and has useful amounts of nitrogen and phosphate too. I find it works well on flowering plants and fruiting plants (such as tomatoes). My armful of Comfrey stems ready to make magic. You can see how well the Soapwort has recovered now, up in its jute plant hanger on the fence. 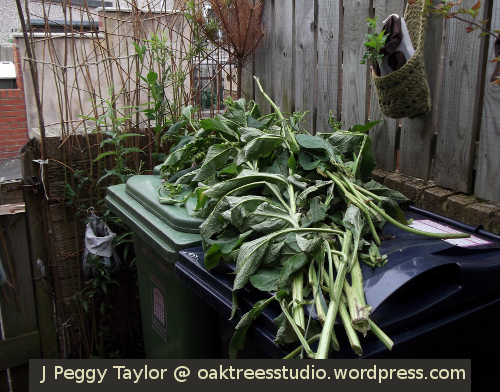 I cut an armful of Comfrey stems which looks quite a large pile, but as I am only using the leaves I knew this would be about the right amount for what I needed. 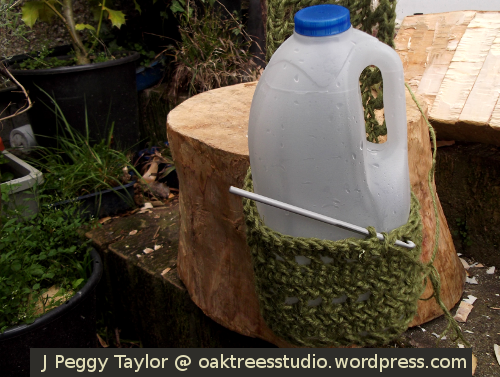 The next task was to make my Comfrey concentrate container from some recycled milk cartons (oh! those useful milk cartons again!). When making Comfrey concentrate, the key is to pack the container as tightly as possible with shredded leaves. There is another way of making Comfrey feed by steeping the leaves in water in a bucket but I know from past experience this is rather smelly and therefore less suitable for my small backyard. So I prefer to make the concentrate and then dilute it as I need it. 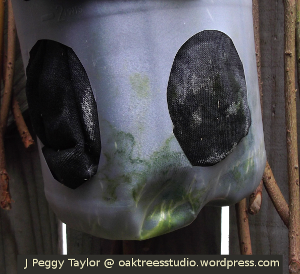 I created my Comfrey concentrate container from three upcycled milk cartons. You can see the small hole that will allow the liquid to drain through into the collecting pot below. I created my Comfrey concentrate container from three milk cartons. Two cartons were 4 pint size and the third was a 2 litre size which fitted conveniently inside one of the 4 pint cartons. I cut off the tops and handle parts of the cartons and cut a small hole, about an inch (2.5 cm) in diameter, in the base of the 2 litre carton. That’s where the liquid feed will drain through into the lower 4 pint carton. 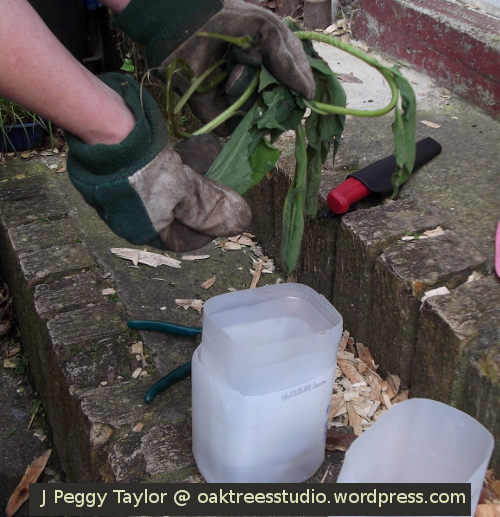 Then it was time to begin shredding Comfrey leaves and packing them into the milk cartons, starting with the 2 litre carton first. I wasn’t cutting the leaves in any special way, just tearing them up. Some of the lower leaves are larger than my hand, around 8-9 inches (20-22 cm) long. Again, I took the precaution of wearing gloves as plant fibres can be quite tough and can easily tear through skin, if you aren’t careful. 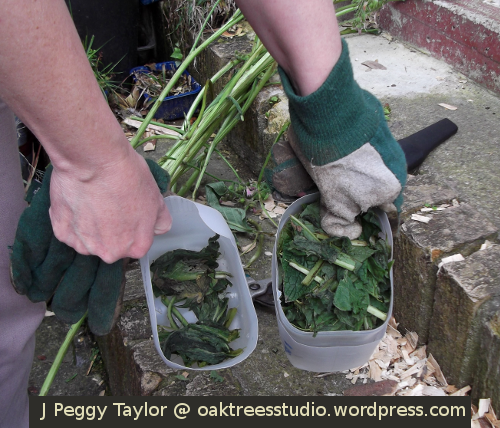 When the 2 litre carton was full of shredded Comfrey leaves, I then shredded the rest of the leaves from the stems I had cut and filled up the 4 pint carton too. 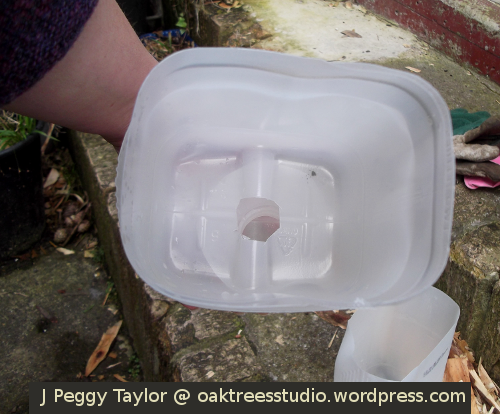 This part was then ready to form the ‘lid’ to my Comfrey plant food concentrate container. Finally, I carefully fitted the ‘lid’ section in place and that was my Comfrey plant food concentrate prepared. Now all I need to do is wait a few weeks until the leaves break down and the rich dark brown Comfrey concentrate will be ready to feed my Sweet Peas and other plants. When I use the Comfrey concentrate, I will add a little to 5 litres of water in the watering can when watering my plants. 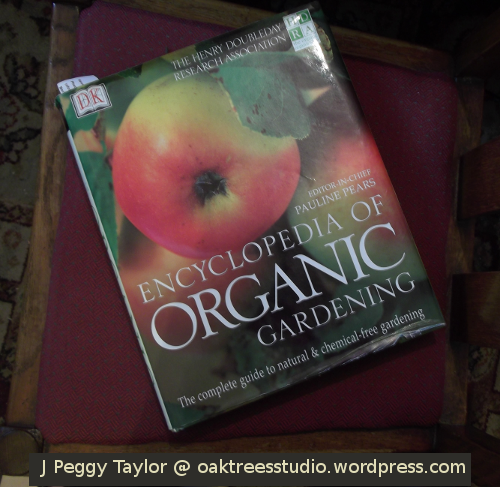 The recommended ratio for use is 1:10 – 1:20 according to my Encyclopedia of Organic Gardening – which I found to be an incredibly useful and practical book, when starting out in organic gardening. To use Comfrey feed on fruiting plants, such as tomatoes, the feed should be used three times a week. So, all I have to do now is wait for my Comfrey leaves to decay gently and turn into my ‘magic potion’ – free, homemade, organic plant food. There’s nothing quite like having your own home-grown herbs right there ready to add a handful of fresh flavour to all kinds of cooking. From flans to fish and stews to salads, I really love being able to snip some of my favourite herbs right when I need them. Not having much space means it makes sense for me to grow the herbs I use most. For me, that means Parsley, Thyme, Sage and Mint. 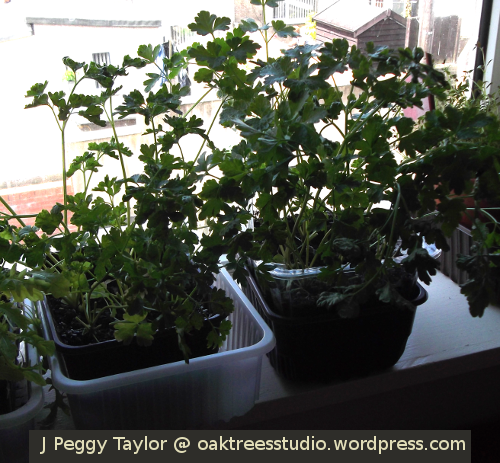 This Spring I sowed my pots of Parsley, Thyme and Sage indoors. I was starting from scratch with most of my herb plants as the previous plants had either reached the end of their productive lives or succumbed to backyard pests! As an extra precaution I went for indoor window ledge gardening for these three herbs this year. It seems a long time since I sowed the Parsley seeds in yoghurt pots back in early March and watched the first little green crooks pop up through the compost. After the seedlings had grown on a little, I potted them up into some deeper recycled vegetable trays, spacing out the plants so they had enough room to grow. The Thyme was sown at the end of March into its own mini-coldframe – an upcycled salad box with a hinged transparent lid. 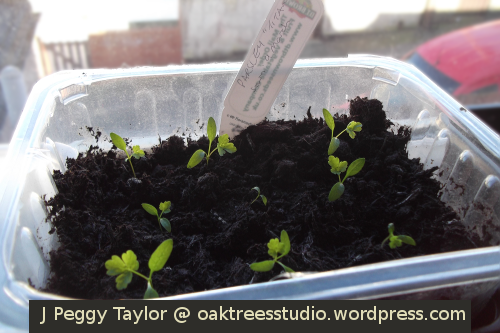 Thyme seedlings really are very small at first so I tend to sow seeds thinly and grow them in a little clump. 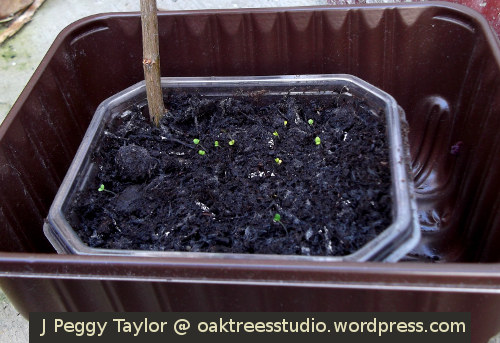 I then leave the Thyme seedlings just as they are without pricking them out separately. When the seedlings grew larger I simply potted up the whole clump into a clay plant pot. I chose a clay pot for the Thyme as it prefers well-drained soil. 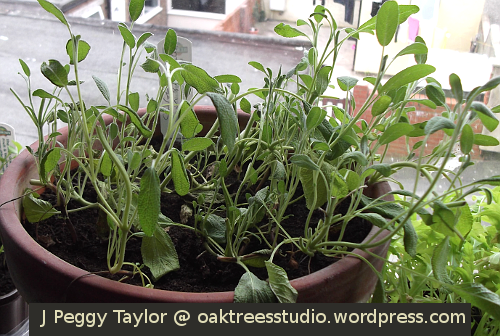 The Sage was sown in early April in its larger sized clay plant pot – Sage also likes well-drained soil. 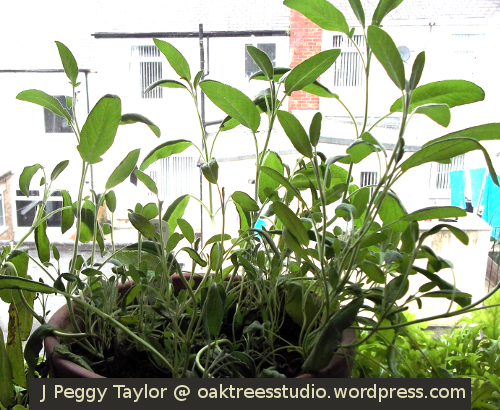 Sage seeds are large enough to sow individually so I carefully distributed twelve of them around the pot. Although it wasn’t especially cold, it took some time to persuade the Sage seeds to germinate. When no seedlings seemed to be appearing I covered the pot loosely with a plastic sheet for about a week, then sure enough, through they all popped up quite quickly after that! 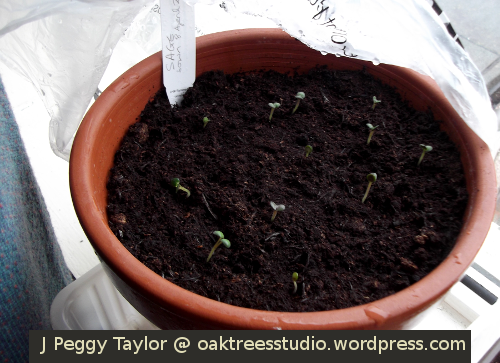 The Sage seedlings were eventually persuaded to put in an appearance – then they all popped through at the same time! 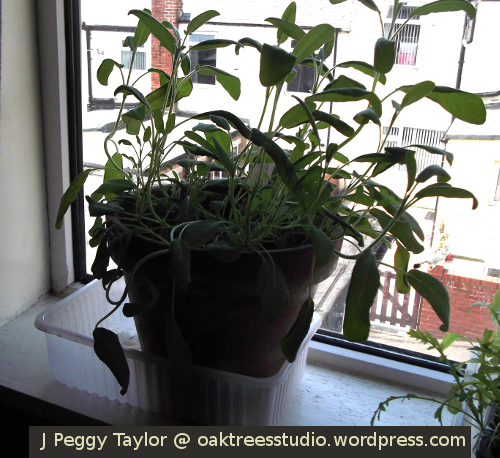 The Sage seedlings certainly very quickly made up any lost growing time – they seemed to shoot away on this sunny west-facing window ledge! 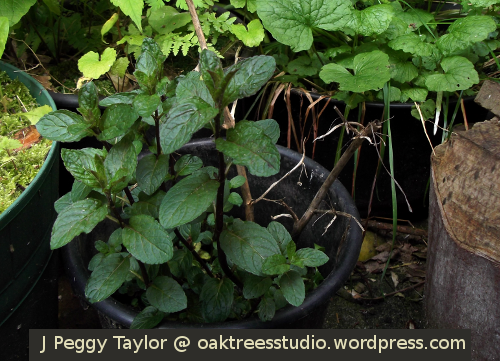 The Mint has grown on well from a cutting I obtained late last Summer. After encouraging this herb on my ‘warm’ window ledge over the Winter, I potted it up and placed it out in my yard in early April. It’s starting to look like a real Mint plant now and at least it seems our slugs and snails don’t care much for menthol so they are steering clear of it, I’m pleased to say! I find growing my own herbs is really easy. Herb seeds, some general purpose compost and some containers to grow them in, that’s all you need. You can see I haven’t gone for any fancy stuff here! 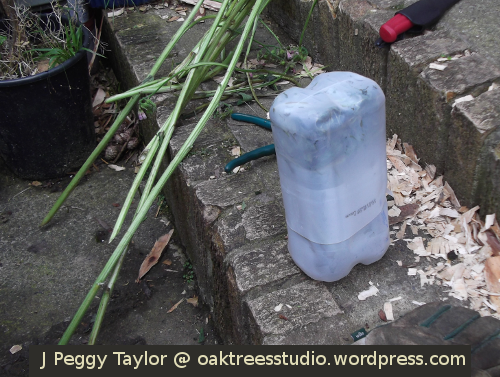 Apart from the two simple clay pots, most of my ‘plant pots’ are recycled packaging from vegetables or other foodstuffs. Yoghurt pots are another of my favourite upcycled containers, along with milk cartons which I do find can be extremely versatile. 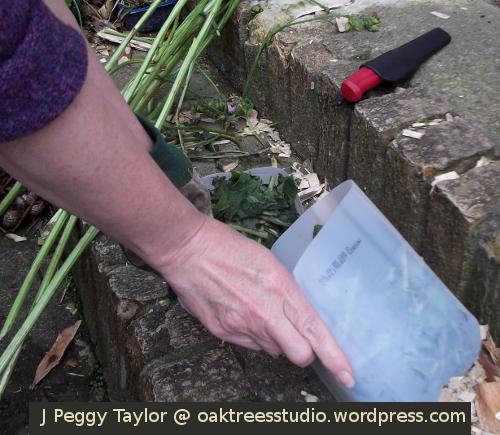 Harvesting fresh herbs couldn’t be simpler – a pair of scissors is all I use. I will usually just cut enough for the cooking task in hand. With Parsley, I harvest starting with the outside leaves. I took my first Parsley ‘harvest’ in early May – that’s a couple of months from sowing the seeds. I’ve aimed to grow enough plants to provide a plentiful supply for our needs, allowing time for the plants to grow on again. The Parsley should continue to grow and provide fresh leaves throughout the year from this indoor planting (unless it gets very cold in winter). With the Sage, Thyme and Mint, I will continue to use fresh leaves over the Summer. However, I shall also start cutting and drying some of these herbs too, for use during the colder months. I’ll show you more on that another time. When I saw Cee’s theme for this week’s Fun Foto Challenge was ‘Things with Edges’ I remembered some unusual artworks we saw earlier this year. The biennial AV Festival here in North East England brings us all kinds of artistic audio visual treats by locally based artists and from artists around the world. Akio Suzuki is a Japanese artist who has been exploring the world of sound since the 1960s when he began what he has called “na ge ka ke” (‘to cast, to throw’) where he takes an action to affect nature and then listens to the resulting phenomenon. This listening part Akio Suzuki calls “ta do ri” (‘to trace and follow’). We experienced several of Akio Suzuki’s installations in the Globe Gallery exhibition in Newcastle upon Tyne. 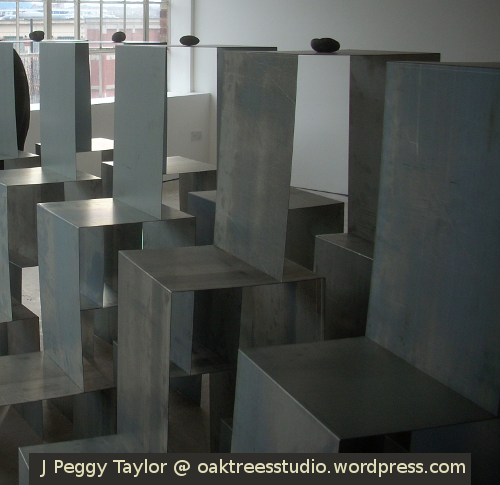 Two of his installations involved ‘Edges’ – in this case, the edges were edges of upcycled metal sheets that the artist had used to ‘hold’ the sound vibrations of his artworks. This new work by Suzuki is called “hi zu mi” (‘distortion’). The sheet metal balances upon stones and rocks selected by the artist from a local North East beach. 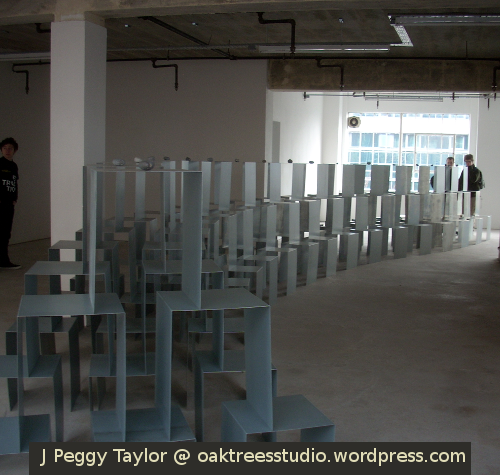 The ‘distortion’ is the gradual absorption of sound as the steel plate bends. Only enough rocks are used to create the work so that the metal plate stops before it touches the ground. A second, larger installation is a work that Akio Suzuki first created in 2003, called “tsu ra na ri”. This one is about rhythm and reverberations. A collection of ‘C-shaped’ tables are supported on their sides in a very careful arrangement. Beach stones of varying sizes were placed on the upper surfaces. Akio Suzuki – tsu ra na ri. Beach stones are placed on the upper surfaces. When the installation is pushed gently (very gently! … by the exhibition assistant!! ), the tower sways and the stones dance, creating a musical rhythm that then gradually fades out to silence. This sound installation worked really well in the stark surroundings of the Globe Gallery. The sound was intriguing and experiencing this artwork definitely made me think of the rhythm of the sea. Marsden Bay, South Tyneside, England. Akio Suzuki was inspired by his research visit to Marsden Bay. Here is another set of related ‘edges’ – the cliffs and beach as the edge of the land; the edge of the sea; in the foreground we have rocks with edges that have tumbled down from the cliffs as part of coastal erosion. 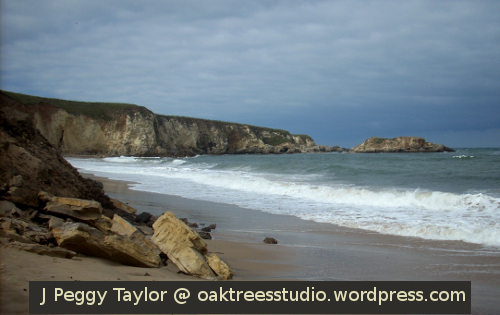 This is Marsden Bay, the beach where Akio Suzuki visited for inspiration and selected his stones for his artworks. 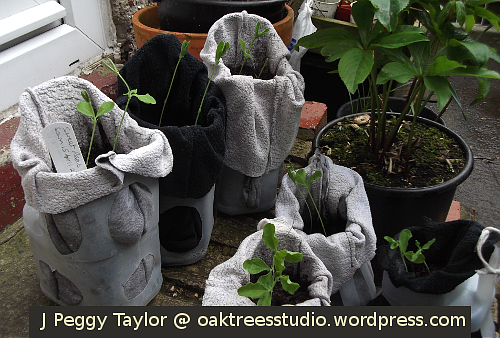 As this is the first time I have tried planting in air-pruning plant pots, I’ve been watching my Sweet Peas very closely over the past seven weeks to see how they get along in my recycled milk carton plant pots with their cosy little made-to-measure fabric grow bags. I must say, I am quietly pleased with their progress. 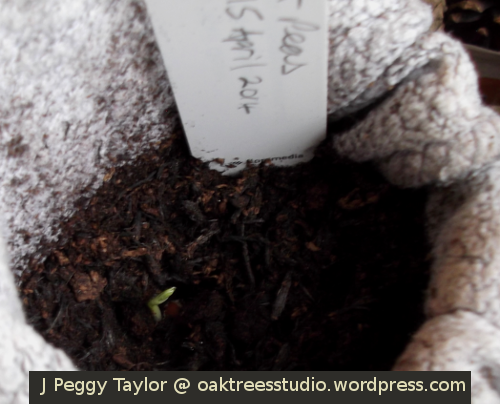 I sowed the Sweet Pea seeds in mid-April – two per pot – and I was delighted to see the first seedlings germinate just five days later. 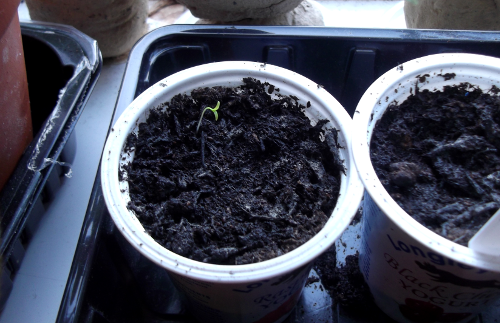 Gradually over the next few days each of the seeds prodded its little green shoot through the compost. 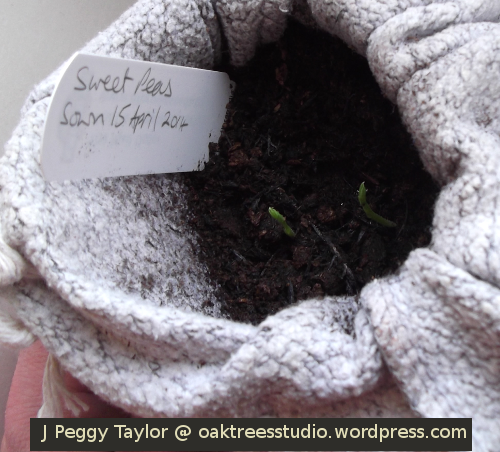 After two weeks my Sweet Pea seedlings were all growing on well. 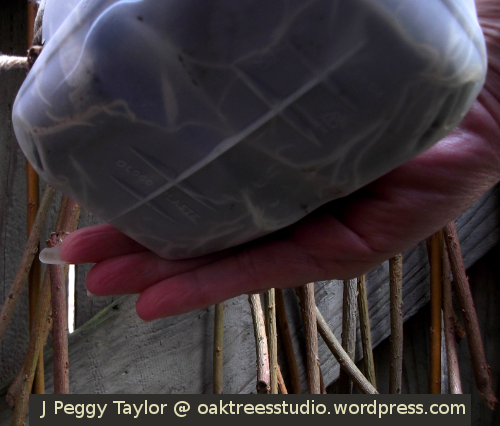 I wanted to give the seedlings time to grow large enough to enable me to thread them onto the jute and willow garden screens I was creating as plant supports. So, for a little longer the seedlings resided on a specially-created plant shelf in an east-facing window – giving them plenty of light without too much strong sun. In mid-May, a month after sowing, my growing Sweet Pea plants were ready for their outdoor adventure. I chose this particular time as we were enjoying a little burst of early Summer, so I knew the plants would be fine outdoors. 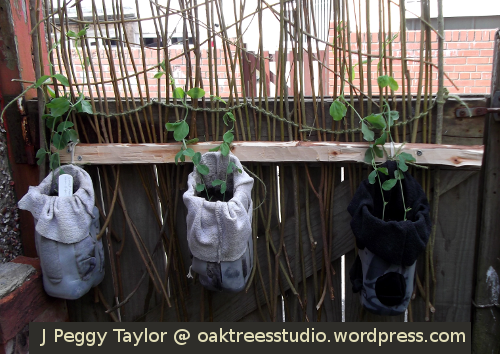 I attached the air-pruning plant pots to the jute and willow garden screen – I’d designed the plant pots with this in mind. Now that the Sweet Pea plants were safely outdoors I gave them a good watering and added some of my ‘magic growing potion’ to give them a good start. Over the last few weeks I’ve been watching over my little Sweet Pea plants. I spotted a suspicious-looking snail on a plant pot one morning so transported it to another location, far-removed from my Sweet Peas! I’ve also been regularly pinching out the side shoots that grow quite prolifically on Sweet Peas. Side shoots will be wonderful later when the plants have fully grown and are ready to flower, but for now they are taking up energy that I’d prefer to see grow into the main plant stem. My only exception to this lately, is with one of the plants that seems to have acquired its own sneaky slimy friend! As various parts of that plant have been eaten already, I’ve decided to let nature take its course and see whether any of the evidently-too-tasty shoots actually survive! Today, I also took a closer look at how the roots are progressing in their air-pruning plant pots. 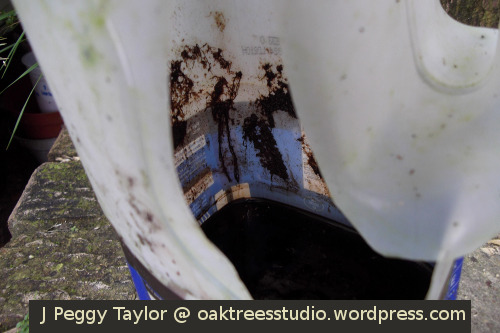 There is some evidence of root growth inside the remaining plastic parts of the milk carton, though none to see where the grow bag is exposed to the air through the large holes. Using air-pruning plant pots is a new experiment for me, so I am observing how plant growth is impacted with this method of growing. 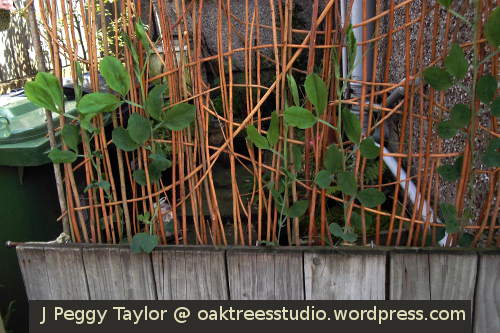 The Sweet Pea plants are certainly growing on well – I think they seem to grow perceptibly each day. This morning, as I checked the plants growing on the willow screen on my backyard gate, I see they have now reached about half way up. The plants measured 24 inches high (that’s about 60 cms)! I loved this post! 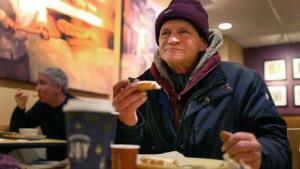 What an amazing … and very heartening idea! Writing in the Boston Globe, Alyssa Edes tells us about Panera, a French bakery/café that has a new business innovation – give your stuff away, for free, or nearly free. What? No prices? No 30 per cent profit margin? How in the world can you run a business like this? Fox Network will scream that this is a Commie plot to undermine capitalism. 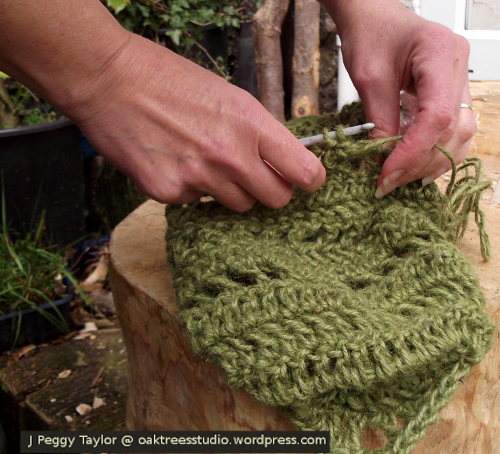 I love crafting in natural materials and this Spring one of the fibres I have been working with quite often is jute. I’ve created several other crochet projects in jute yarn in the past, but my recent experiments have been focused on outdoor, functional items. For example, I chose jute yarn to bind together the willow rods I used for my willow garden screens that I’ve posted about previously. My latest jute crochet project has been to create hanging baskets to hopefully accommodate my Soapwort seedlings out of munching distance of the slugs and snails in my back yard! What is it that I love about jute? The jute yarn I am using was really designed as garden twine. It is rough and tough but I love its texture and strength. For those of you who crochet or knit, I’d say in yarn weight, this jute yarn is chunky. I used a 4.50mm crochet hook for this project. Jute is quite stiff to work and doesn’t stretch, so it can be quite a physical work-out for the hands and fingers when crafting in jute yarn. Jute yarn is made from plant fibres extracted from the White Jute plant. The golden colour and silky sheen of jute in its natural state has led to it being called the ‘Golden Fibre’. Jute is a crop of tropical lowlands with high humidity, so much of it is grown in India and Bangladesh, on the Ganges delta. Jute is completely biodegradable and therefore, usefully, it is also recyclable and compostable. The process of growing jute is also very environmentally-friendly as it doesn’t require pesticides or fertilisers, making it a good choice for those of us seeking to be more planet-friendly in how we live and work. 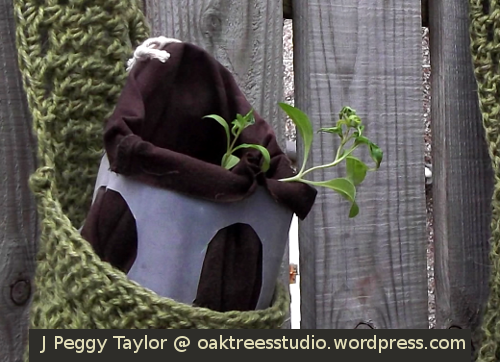 For my hanging basket project I needed a yarn that would be strong enough to take the weight of its intended plant pot cargo and could take some months of outdoor use. With the additional advantages of producing a breathable fabric and having moderate moisture retaining properties, jute fitted my purpose. In keeping with my overall plan to make use of more vertical space in my back yard, my intention was to hang my two Soapwort baskets on the fence. For this I needed a design that incorporated a flat back panel but with enough capacity in the basket to accommodate the recycled milk carton air-pruning plant pots I’d used for the Soapwort. Here I’m demonstrating crocheting the jute basket. I’m using a 4.50mm crochet hook with this tough jute yarn. 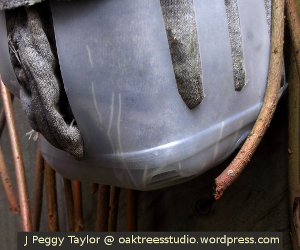 At the bottom of this image you can see one of the hanging loops that I incorporated into the back panel of the basket. I constructed the back panel first, using an elongated oval technique that I find very useful in all kinds of crochet projects. 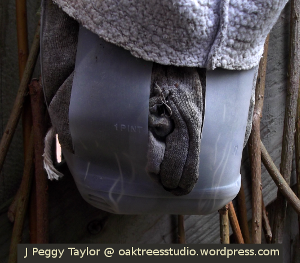 I also included fixing loops at both the top and bottom of the back panel ready to fasten the basket to the fence. Trying out the milk carton for size – my air-pruning plant pots are made from recycled milk cartons. You can see the rows of open mesh crochet on the basket to give added breathability and drainage. The basket part of the plant hanger I found was best constructed in conjunction with an example of the size of pot it was going to hold. The basket is crocheted onto either side of the lower half of the back panel. To provide extra breathability and drainage, I added several rows of open mesh into the basket crochet. I made sure the basket was deep enough to contain the plant pot without any risk of it falling out – even in a strong wind! 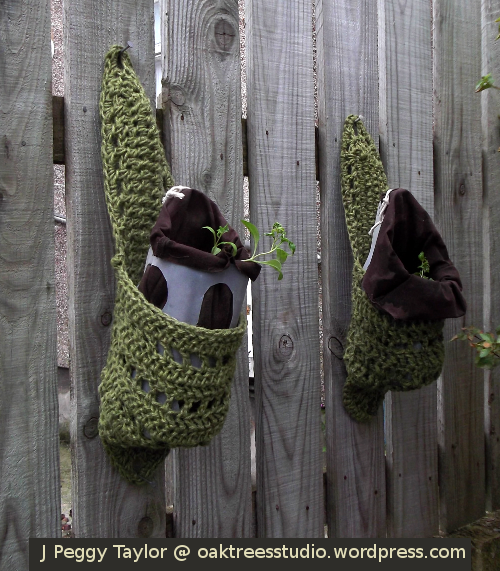 When I’d completed both of my crochet jute plant hangers, it was time to fit the Soapwort plant pots into them and get them hung up on the fence. With their integrated hanging loops this was very easy. 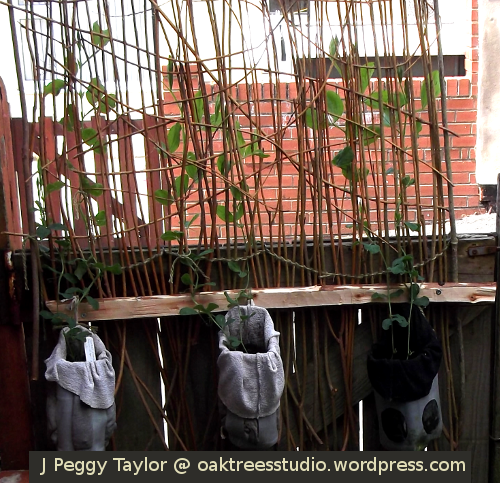 I used large-headed nails to hang up the plant baskets – one at the top, one at the bottom. They do seem pretty well fixed and I am hopeful this will prevent them from coming adrift in the wind.